This is the homepage for the Systems Services Payroll Advance Web Interface. If you are an Employee and would like to request an advance on your payroll, simply login using your PayCard Number. If it is your first time logging in, your password will be the last four digits of your PayCard Number. Once you login for the first time, you will be required to change your password and setup some security questions. Once that is complete, requesting a Payroll Advance can be done in just a few simple steps. This lender offers short-term loans. Please read and understand the terms of the loan agreement before signing. The maximum annual percentage rate currently being charged is 912.50%. 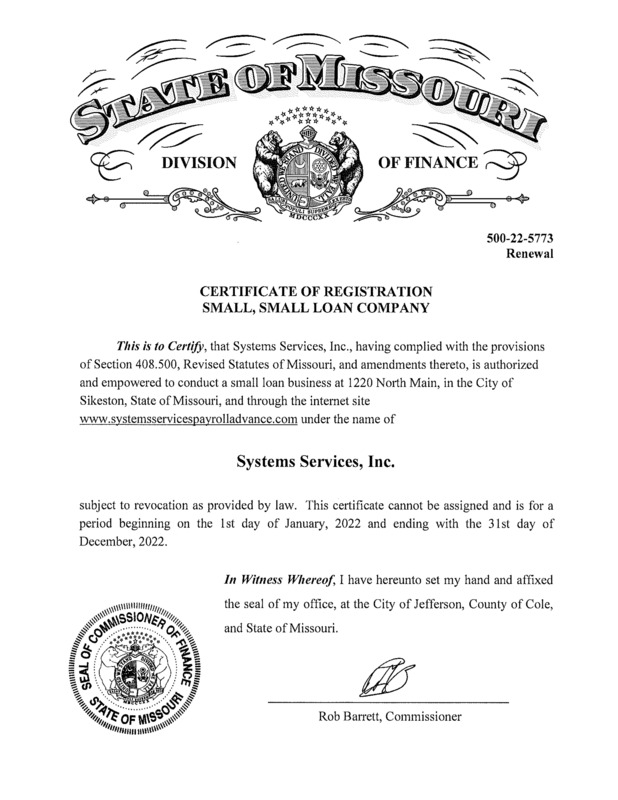 This lender is regulated by: Missouri Division of Finance. P.O.Box 716 Jefferson City, MO, 65102-0716.